Natural teeth whitening methods at home can help to remove yellow stains from teeth. As we age, teeth naturally lose their pearly-white color and can start to darken. You can whiten your teeth at home by using products such as baking soda, hydrogen peroxide, charcoal, or coconut oil. Apart from the age process darkening teeth, there are a number of other reasons why you may look for home remedies for yellow teeth. Foods such as coffee, tea, dark juices, and sodas can all result in a loss of whiteness on your teeth. That is why natural whitening toothpaste contains gentle abrasive ingredients such as baking soda to buff away stains from the surface of teeth. In this article, you will find out how to whiten your teeth naturally at home. You will also learn about the best ingredients to use in a homemade teeth-whitening toothpaste. Your teeth are naturally white because they are covered by a fine layer of enamel that contains calcium. Over time, a thinning of the enamel layer results in teeth that appear yellower in color. One reason for needing to whiten teeth is smoking. Nicotine stains teeth over time and causes teeth to become dark and dull. Some of the natural toothpaste remedies in this article can help remove yellow cigarette stains from teeth. Why Choose Natural Teeth-Whitening Methods? Most people desire white teeth because they are associated with good dental health and success. There are also many reasons to find out how to whiten your teeth at home naturally. Many “whitening toothpastes” contain chemicals and artificial ingredients that could affect your health. Some commercially-available whitening products can also increase teeth sensitivity or irritate gums. Although plaque on teeth is a colorless substance, a buildup of plaque can lead to stains on your teeth. So removing the plaque could also help to get rid of yellow stains on your teeth. Tartar can cause yellow to brown staining on the teeth and can lead to gum disease. A study from 2012 found that the soft materials leading to plaque formation are affected by the colorants in food more quickly and undergo color changes. (25) This effect can also cause the plaque buildup to have a yellowish color on teeth. Let’s look at how to get rid of yellow teeth and see what scientific research says about home remedies to whiten teeth fast. You will find out how to use baking soda, hydrogen peroxide, charcoal, and other natural ingredients to get whiter teeth at home. Baking soda whitens teeth because its grainy texture and antimicrobial properties help remove stains from teeth. Baking soda also gets rid of bacteria from your mouth which freshens your breath. Baking soda (sodium bicarbonate) is a natural ingredient in many tooth-whitening toothpastes. You can easily and safely use baking soda as a cheap way to clean yellow teeth. You can easily make your own paste to remove stains from teeth by mixing some baking soda and water into a thick paste. Brush your teeth with the baking soda every two days to whiten your teeth. Baking soda is a very versatile ingredient to have at home, and you can learn more about the benefits of baking soda to your health in general. You can also find out how to use baking soda to treat symptoms of acid reflux. This is also important in keeping your teeth pearly white. Acidic juices from your stomach can cause yellowing of teeth and weaken tooth enamel. 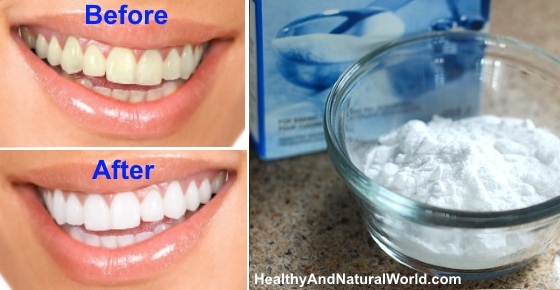 What about baking soda and lemon juice to get white teeth? Some people also use the teeth-whitening properties of baking soda along with lemon juice to help get stains off teeth. Some studies have suggested that a mixture of salt and lemon juice has mildly abrasive properties. The cleansing action of sodium and citric acid can help to whiten teeth over time. So, occasionally using a mixture of lemon juice and baking soda for their natural whitening properties may help to bring back sparkling whiteness to your teeth, but this should be done infrequently as not to have any negative result on your oral health. Mix a tablespoon of baking soda with the juice of ½ a lemon to create a lemon and baking soda teeth whitening paste. Use the natural paste not more than once a week to help gradually remove stains from teeth, including removing nicotine stains. Another way to get rid of yellow teeth and to make them brighter is to combine hydrogen peroxide and baking soda. Hydrogen peroxide may help to get rid of tobacco stains from teeth or yellow stains caused by drinking coffee. Hydrogen peroxide is a natural bleaching agent that can help to make teeth whiter. You can help to get rid of various types of stains from teeth by making your own baking soda and hydrogen peroxide remedy at home. Mix some 3% hydrogen peroxide with a tablespoon of baking soda to create a thick paste. Use the natural paste as you would regular toothpaste to clean your teeth and remove yellow stains. Leave the paste on your teeth for 3 or 4 minutes before rinsing and spitting out. For best results in getting your teeth to look whiter naturally, use the hydrogen peroxide toothpaste 2-3 times a week. Learn more about using hydrogen peroxide at home and what precautions you should take. Another way to help reduce bacteria in your mouth and scrub surface stains from teeth is to use coconut oil. Coconut oil along with baking soda can create an anti-plaque toothpaste that helps buff away yellow stains from teeth. You can make a larger batch of natural coconut oil toothpaste to help keep your teeth clean and free from bacteria. Mix together 2 tablespoons of virgin coconut oil with 2 tablespoons of baking soda. Add 2 drops of peppermint oil if you want to give the whitening toothpaste a fresh scent. Use morning and evening to clean your teeth and prevent unsightly yellow stains from forming on your teeth. When you have achieved the level of tooth whiteness you require, use the baking soda/coconut oil toothpaste 2-3 times a week to maintain sparkling white teeth. Further reading: Why You Should Start Using Coconut Oil as a Toothpaste. One of the natural ways to whiten teeth without resorting to expensive dental treatment is to use toothpastes containing fruit enzymes. Although you would think that charcoal stains teeth black, it may have the opposite effect in helping to make teeth whiter. Crush one charcoal tablet into a find powder, or if you have activated charcoal capsules, you can carefully open them and remove the powder. Dip a clean, wet toothbrush into the powder and brush your teeth as normal for around 2 minutes. Carefully spit out the mixture and rinse well. You may need to repeat rinsing a few times before all the activated charcoal is fully rinsed out. For best results, you can use activated charcoal to clean your teeth 2 or 3 times a week. Find out more about how to use activated charcoal and how brushing your teeth with charcoal can help to get rid of yellow teeth for good. Oil pulling involves swishing cold pressed oil around your mouth for 20 minutes to help prevent the buildup of yellowing dental plaque. In my article “Why You Should Start Oil Pulling Today” you can find detailed information about the research on oil pulling, which other oils you can use, and how to incorporate this habit as part of your regular dental hygiene routine. Is Apple Cider Vinegar Good to Remove Stains from Teeth? Apple cider vinegar is a natural disinfecting agent that may help keep your mouth free from plaque-causing bacteria. As with lemon juice, you should use caution when using apple cider vinegar for teeth whitening at home. The mentioned study found that vinegar can also erode tooth enamel if it is in contact with teeth for too long. So, you could use an apple cider vinegar mouth rinse infrequently to reduce bacteria and help prevent tooth staining. Dilute 1-2 teaspoons of apple cider vinegar in a cup of warm water. Swish the natural mouthwash around your mouth for a 30 seconds. Rinse your mouth with plain water to remove any residue of acidic vinegar. Don’t use apple cider vinegar mouthwash every day to prevent tooth enamel damage, and also limit the amount of time that this rinse is in contact with your teeth. Also don’t brush your teeth immediately after consuming anything acidic and wait at least a half hour before brushing your teeth. Brushing your teeth immediately after using this mouthwash will remove even more enamel from the weakened state of your enamel. There is no evidence that banana peel can get rid of yellow teeth; however, there is some evidence that compounds in the peel benefit dental health. Some people claim that using banana peel to rub on your teeth helps to make them whiter. They say that potassium, magnesium, and manganese in banana peel helps to remove stains and strengthen enamel. Find out more about how bananas can boost your health and how to use banana peels to help look after your dental health. There is evidence that turmeric indeed benefits dental and gum health (26, 27, 28, 29), however there’s very little research to support turmeric whitening ability. Still there is anecdotal evidence that for some people it works as a teeth whitener, so you may want to give it a try. Of course, to help prevent yellow stains on teeth due to nicotine, coffee, red wine, or sugary sodas, it’s important to care properly for your dental health. You can also try using this homemade eggshell and coconut oil toothpaste to remineralize your teeth to reduce the number of cavities and white spots on teeth. As well as using natural whitening toothpaste to remove surface stains from teeth, it is important to avoid foods and habits that cause teeth staining. Don’t consume too much vivid-colored spices. Some spices such as turmeric, paprika, and curry can lead to yellowing of teeth over time. If you are trying to whiten your teeth at home to fix yellow teeth, then it’s important to be aware of a few precautions. There are many over-the-counter teeth whitening strips for sale that may help to brighten yellow teeth. For many people, the safest and cheapest way to whiten teeth naturally is to try first some natural ingredients such as baking soda or hydrogen peroxide. I have been making my own toothpaste for years. Consisting of following: Bicarbonate of Soda (available from most supermarkets as baking powder, Sea-Salt (not table salt) and peppermint oil (available from drug stores). I have been bothered for years, I tried bi-carb it didn’t work. but two weeks ago, I tried activated charcoal, (very messy) but the improvement was huge, not white yet but half way there, and my teeth weren’t stained they were blackened. i have a natural remedy from Ayurveda… make a mix of turmaric and salt twice a day. No, these are 2 different things. Don’t replace between the two. Use baking soda. Mmmhhh I like using natural methods, so let me try using the eggshells. When can one start noticing the results? The eggshell toothpaste is more to remineralize teeth and targets the white spots on teeth that are often a result of poor oral hygiene that cause demineralization in the tooth structure, although the gentle abrasive nature of the eggshells may work similarly to baking soda to whiten teeth. Home remedies usually take longer to take effect than commercial applications. Also results vary between different people. In research number 8 mentioned in the article it took the 3% hydrogen peroxide to brighten teeth over a 6-month period, so I can’t give you an exact time frame, but at least several weeks to probably a few months.